Mill-Max now offers solder pre-forms. 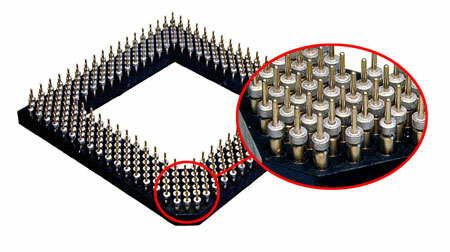 Solder pre-forms enhance the assembly of large pin grid array (PGA) sockets. The main benefit of solder pre-forms is the placement of solder directly between the lead and the hole. This ensures a good solder joint. Solder pre-forms allow our customers to attach thru-hole devices onto a board soldered using reflow methods. This allows for mixed technology boards. The solder pre-form is 63% tin and 37% lead. All Mill-Max sockets use precision machined pins which eliminate any possibility of solder wicking or flux contamination. Press-fit into each pin receptacle is a low force beryllium copper multi-finger contact renowned for greater compliancy and proven reliability.